Lt Col Allan T. Stein served as a US Air Force pilot on missions over China and the Sea of Japan during World War II. He served in Vietnam as the operations officer for the 360 TEWS: Tactical Electronic Warfare Squadron. By the time he retired he had flown everything from BT-13s and B-24s to C-47s and B-52s. He ended his career as inspector general of the Civil Air Patrol during the years in which Jim Garrison connected CAP members David Ferrie, Barry Seal and Lee Harvey Oswald. He retired on August 1st 1969 after serving as the CAP-USAF Inspector General for Civil Air Patrol. 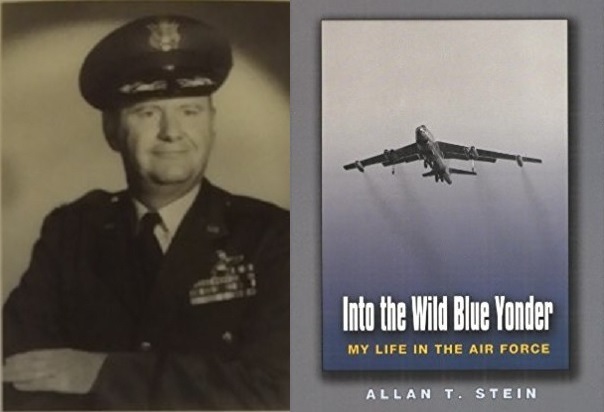 In 2005, Lt Col Stein published a biography “Into the Wild Blue Yonder: My Life in the Air Force” through Texas A&M University Press. He was disgusted with the corruption he encountered in the Civil Air Patrol as he was with the tendentious reporting he met in Saigon’s Hotel Caravelle. This disgust is recorded in Chapter 12 of his biography, parts of which are presented below. After a couple of years of the Civil Air Patrol inspector general fiasco, I had just about all I could take. I did no think they would ever consider me for the position of chief-of-staff, so when they started talke about another year in Vietnam, I felt my family needed me more than the air force needed me in Vietnam, so I retired. This was probably another career mistake, but I was ready to move on. So on August 1, 1969, I retired. Be the first to comment on "Retired CAP-USAF IG publishes biography"
Sadly, CAP has chosen to conduct personal attacks on top USAF leaders, rather than focus on the issues. In several instances, press releases by CAP National Headquarters have cross the bounds of proper decorum. CAP Region Commanders referred to actions by top USAF leaders as ‘slimy,’ called them ‘liars,’ and proclaimed them worthy of ‘removal from office. Unless corrected, these attacks will permanently breach the CAP-USAF relationship.